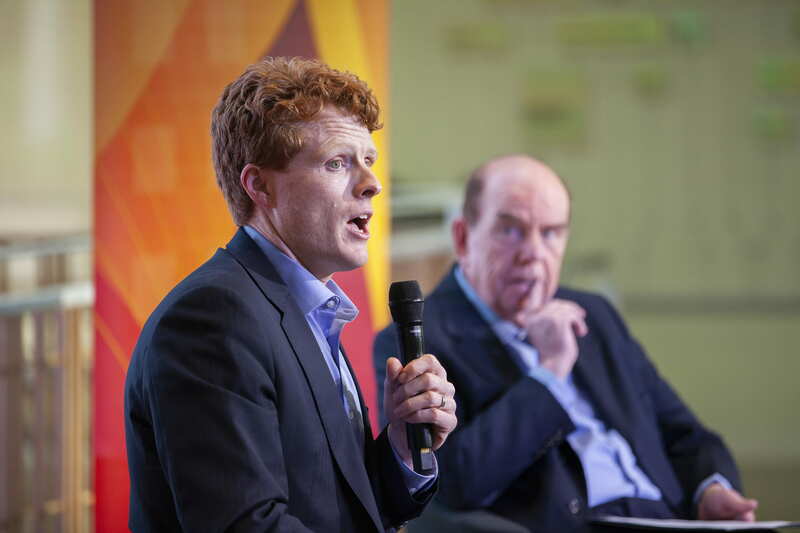 For Representative Joe Kennedy III, politics has a lot to do with principles. The USC Annenberg Center on Communication Leadership and Policy partnered with the Center for the Political Future and Undergraduate Student Government to invite the Massachusetts congressman to campus on March 19. Speaking to a crowd gathered in Wallis Annenberg Hall, Kennedy acknowledged his roots in one of America’s oldest political dynasties. “I’ve had some family members that served in office before,” he said to laughter from the audience. Kennedy’s father was a congressman, his grandfather a senator and U.S. attorney general, and his grand-uncle the president of the United States. He spoke to students about his decision to run for office representing Massachusetts’ 4th District in 2012, as well as the future he envisions for Democratic politics and the country as a whole. After serving in the Peace Corps, Kennedy, 38, began a career as a prosecutor — a path that eventually led him to try to enact change at a legislative level. “My goal is to try to move the needle to make sure that in my mind, our country lives up to its values,” he said. One of the major challenges to those values, Kennedy argued, was economic inequality, which has grown worse for Americans in recent years as student loan debt has soared and wages have stagnated. His passion about this issue led him to endorse Sen. Elizabeth Warren in her 2020 presidential campaign. Rep. Joe Kennedy spoke with CPF Director Bob Shrum on March 19 in Wallis Annenberg Hall. Ultimately, this means the Democratic party has to improve its messaging for economically disenfranchised voters, Kennedy said. Its failure to do so was one of the reasons President Donald Trump received widespread support in 2016. Toward the end of the conversation, Kennedy polled the audience members on the issues that were most important to them, taking note of students’ policy priorities as points to focus on in the next presidential race. He urged young voters, many of whom were in the crowd, to make their voices heard in 2020. “We need you not to sit this one out,” Kennedy said.